Omar did a fine job. The firm ran the tour even though there was just one person. It was fun and would definitly recommend it if you have less time. This was a magical way to see the city. Because Copenhagen has bike paths everywhere, the segway was very safe and a great way to get around. Guide was terrific and took us to all the major sites. We saw the entire city and had a great time doing it. This was a fantastic tour!!! There was 4 of us traveling together, and 2 had not tried Segway before, and they were very nervous. The people at the Segway office had an indoor practice area and were very patient and efficient in their training. Within 5 minutes of practice, our friends had it down and felt very confident to go on the tour! Our guide was Paul. He was very knowledgeable and friendly. The best part of tour was our helmets! They were wireless intercom so we could hear Paul all along the tour! I would HIGHLY recommend this tour!! And our friends are looking forward to their next chance to ride a Segway!! We had a fantastic tour around Copenhagen. Our guide was very informative and fun, and he made sure we traveled safely at all times. I would highly recommend this tour. This is my third visit to Copenhagen, and this tour made the city come alive for me. Our guide was high energy, filed with historical and social information and also gave relevance to the needs of a diverse group from 13 years old to the seniors. It is hard to imagine that we were able to cover so much interesting history, current economic and business development and the love of the people for their monarchy. We will definitely put Copenhagen on our list for another visit. Just a great day! Brilliant! The best thing we did in copenhagen. Take gloves and warm clothes though! This is without a doubt the best way to see Copenhagen.WOW! This is one of the best tours I have ever done. 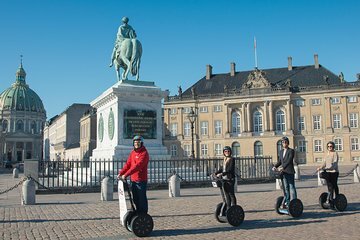 Do this tour when you first get to Copenhagen and it will help you get you get familiar with Copenhagen. I really enjoyed the 2 hour tour, The is a must do tour!